According to a new study published online in the journal Cancer, genetic factors and the consumption of meat cooking mutagens may increase the risk of kidney cancer. Renal cell carcinoma (RCC) is the most common form of kidney cancer amongst adults and the incident rate has been rising across the U.S. and other industrialized countries. Previous studies have shown that there is an association between meat intake and the increased risk of RCC. The reason why is still unclear, but researchers believe that cooking meat at high temperatures, specifically when pan-frying or barbecuing, can lead to the production of carcinogens. The research team, led by Dr. Xifeng Wu from the University of Texas MD Anderson Cancer Center, believes that high meat diets, processed starches and foods may have a direct impact on the development of RCC. The team set out to determine the association between genetics and the dietary intake of meat cooking mutagens, such as MelQx and PhIP, and risk of RCC. The study included a total of 659 patients who were recently diagnosed with RCC and 699 healthy control subjects. Compared to the healthy patients, those with kidney cancer consumed more white and red meat. They also consumed more cancer-causing chemicals that were produced by cooking meat at high temperatures, mainly when barbecuing or pan-frying. Those with RCC also had a higher daily energy intake and a lower vegetable and fruit intake. The team found that ingesting MelQx almost doubled the risk of RCC, and PhIP increased the risk by 54%. Researchers concluded that consuming high temperature cooked meats may increase the risk of RCC through mutagenic cooking compounds. There was also an interaction between PhIP and a genetic feature. This implied that individuals who have certain genetic variants may be more prone to the harmful effects of these cancer-causing chemicals. These findings suggest that genetic testing and reducing meat consumption could decrease one’s risk of developing RCC. 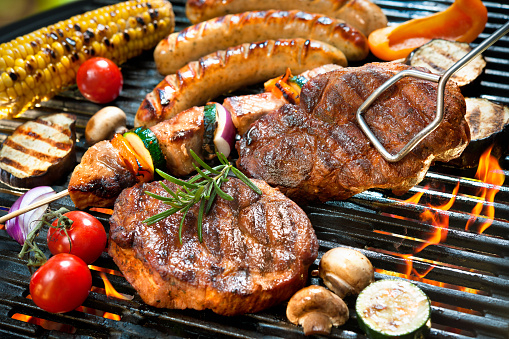 Brazier, Y., “Will avoiding meat reduce risk of kidney cancer?,” Medical News Today web site, November 9, 2015; http://www.medicalnewstoday.com/articles/302146.php. Melkonian, S.C., et al., “Gene-environment interaction of genome-wide association study-identified susceptibility loci and meat-cooking mutagens in renal cell carcinoma etiology,” Cancer, published online November 9, 2015, doi: 10.1002/cncr.29543.